Thread: Your’re hot, Thermometer chart! A couple of days ago, prijip contributed a thermometer chart to Pentaho Reporting. Thank you, it’s good to see that our product is useful! Thermometer charts are one of the many variations of a typical “Traffic light” indicator and great if you have to monitor a single KPI for critical levels. The typical chart shows you three levels of ‘hotness’ – normal levels show you everything is fine, critical levels require your attention, and above that, lets just panic. As it is implemented, the thermometer chart is great when you need to make the indicator big and bold and hard to miss. The thermometer’s color will change according to the value level reached. And unlike the traffic-light function that changes background colors on text, this chart is an easy to interpret symbol that is intuitively understood by everyone. 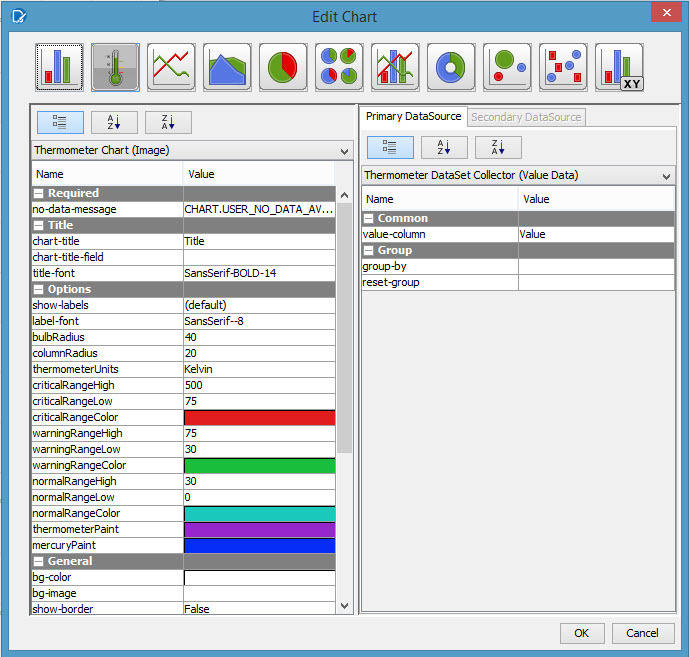 The chart requires only a single value to work, but be aware that due to the nature of the charting framework in our reporting engine, it needs at least a single row of data to receive at least one “items-advanced” processing event. Even if the value comes from parameter or calculation, you have to have at least one row of data. If you have more than one row of data per grouping, the chart collector will aggregate all values together as one big sum. The chart itself almost self-explaining, and is quite easy to configure: provide the ranges, provide proper colours (in case you don’t like the off-the-shelf green, yellow and red range) and some labels, and voilà, a thermometer. Personally, I don’t find the limited selection of units of just Kelvin, Celsius and Fahrenheit thrilling. So unless you are monitoring temperature, disable them and the thermometer is rather suitable for all sorts of monitoring of value levels. Needless to say: If we have not covered your favourite property – like all charts, this chart type has the option to customize it via scripts. 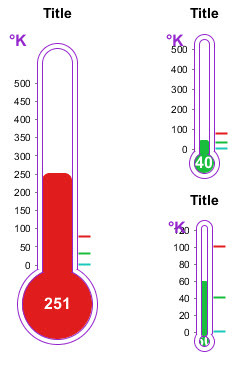 The thermometer chart and many more goodies will be part of the upcoming Pentaho 5.3 release. The post Your’re hot, Thermometer chart! appeared first on Reporting Tales.